Thus, for the reversible Carnot cycle operating with no frictional or other losses (i.e., operating under maximum efficiency conditions), it can be shown5 that where T1 and T2 must be in kelvin. It turns out, in fact, that nmax is the maximum efficiency for any heat engine operating between two temperatures. Thus, the maximum efficiency depends on the difference between the two temperatures, T2 — T1, at which the engine operates; it becomes more efficient as the temperatures T1 and Ti move farther apart. Since, for most purposes, room temperature (300 K) is usually the lowest practical value for T2, much effort has been expended to make T1 as high as possible for various engines. For example, superheated steam, rather than ordinary steam has been used in steam engines (high pressures are necessary for this). The important thing to note here is that there is a theoretical maximum efficiency for engines that do useful work [equation (15-5)]; an actual engine running between these two temperatures generally will have an efficiency considerably less than this maximum possible efficiency because it operates irreversibly and has various other losses. We have seen, for example, that an engine in an automobile being driven under highway conditions has an efficiency of approximately 15%. If this engine could be assumed to be operating as a reversible Carnot cycle engine between 1000 and 300K, its efficiency would be 70%. The second-law limitation becomes even more important when the high-temperature heat source is at a much lower temperature, such as geothermal, or nonfocused solar sources, or bodies of water. It is pointed out in Section 15.5.3.3, for example, that solar ponds have at most a temperature gradient of about 50°C, giving a maximum second-law efficiency of the order of 15%. 5See any elementary physical chemistry textbook: for example, R. A. Alberty and R. J. Silbey, Physical Chemistry, 3rd ed., Wiley, New York, 1001. Thus, consider a building being maintained internally at 22°C (295 K) with an outside ambient temperature of —5°C (268 K). From equation (15-6), only a minimum of about 100 J of electric work would have to be expended in order to pump 1000 J of heat into the building, or about 10% of the energy required if the 1000 J of heat was supplied to the building at maximum efficiency by electric resistive heating. It is important to emphasize that the maximum efficiency limitation given by equation (15-5) is a second-law limitation restricted to the conversion of heat into work. Other parts of the overall conversion from chemical to electrical energy are generally much more efficient than the heat-to-work component. Combustion efficiency can be as high as 98%, boiler heat transfer efficiencies are typically 80-90%, and mechanical-to-electrical is often greater than 90%. If heat is not involved, the second-law limitation does not apply, although the first law conservation of energy limitation will still be applicable. The direct conversion of solar energy to electrical energy (see Sections 15.5.4 and 15.5.5) and of chemical energy to electrical energy as in fuel cells (Section 15.9) are examples of such processes, as are conversions of wind or wave energy to electrical energy. However, other limitations on the efficiencies of some of these processes—for example, restrictions on the efficiencies of solar photovoltaic cells (Section 15.5.4)—may be even more restrictive than the second law. Indeed, at the present time virtually all the chemical energy of fossil fuels and the nuclear energy of fissile fuels is first converted to heat before being converted to mechanical (and then on to electrical) energy. The waste heat from our various engines is usually rejected into the environment and there becomes "thermal pollution," although in some cases this "rejected" heat is used as a by-product for domestic or industrial heating. We saw in Chapter 3 that cities are always warmer than their surrounding countryside partly because of the rejected heat from all the machines and engines used in the city. Large electric power plants, whether of the steam or nuclear type, reject their waste heat into a very small volume of the environment. When these power plants are water cooled, the streams and lakes into which this water is usually released may become much warmer and change the environment for aquatic life. Large populations of fish may be killed, or, alternatively, attracted by the new, warmer environment. Since the conversion of thermal energy (heat) to mechanical and ultimately to electrical energy is limited by the second law, thermal energy (designated by subscript "th") is often referred to as low-grade energy and electrical energy (subscript "e") as high-grade energy. It always takes more than 1 kWhth heat from the combustion of coal or from any other fuel to produce 1 kWhe of electricity from a fuel-fired electric power plant, not only because of the second-law limitation but also because no real process is as efficient as a hypothetical reversible cycle. Fossil fuels in the form of coal, petroleum, and natural gas account for 90% of all the energy used in the United States (Section 15.10.1). The growth in the use of fossil fuels as an energy source has been very rapid, as evidenced by the fact that wood supplied 90% and coal only 10% of the energy used in the United States in 1850. Coal and wood supplied equal proportions of energy in 1885. Undoubtedly this change from wood to coal reflected the greater ease in obtaining large amounts of coal required for the new industries developing in the United States. However, some of the incentive for the change may have also been the "energy crisis" resulting from cutting down most of the readily available trees in the eastern United States. FIGURE 15-2 Projected global primary energy production by energy type (conservative case). Coal remains the primary fossil fuel source, with a rise and eventual decline of oil and growing levels of energy from natural gas, uranium, solar, and other (e.g., biomass) sources. From C. Starr, M. F. Searl, and S. Alpert, Energy sources: A relative outlook, Science, 256 981-987. Copyright © 1992 American Association for the Advancement of Science. reserves was published by the U.S. Geological Survey in 2000 which indicates that there is 20% more oil to be discovered in the world than was estimated in 1994 (Figure 15-3). In this estimate the world's oil production will peak in 2050, while the more pessimistic 1994 estimate is 2015. The pessimists note that global oil consumption is 27 billion barrels a year and is increasing by 1.52% each year. The postulated and undiscovered reserves are estimated to amount to about 2300 million barrels, with the United States having about 8% of that. The projected U.S. reserves were doubled in previous estimates, but the new estimates note no further increases. The extraction of oil from these U.S. reserves will be more costly because more expensive technologies will be required to retrieve the remaining oil. There was little change in the estimates of coal reserves in this time period, and the current supply of coal is sufficient to meet all our energy needs for the next 200 years. In 1999 coal-powered generators accounted for 56% of the electricity produced in the United States and 36% in the world. Energy conservation is projected to be the biggest "energy source'' from about 2020 on into the future. That is, projected future energy needs, based on current practice, will be reduced by greater efficiency. FIGURE 15-3 The amounts of oil already produced, known to be in the ground, and yet to be discovered in the world. Estimates for the United States are not included in this figure but can be found in earlier estimates. Redrawn from R. A. Kerr, Science, 289, 237 (2000). Oil is a convenient energy source because it can be obtained cheaply, it is easy to transport, and, when burned properly, it produces low levels of environmental pollutants. The technology for the separation and conversion of crude oil into a variety of hydrocarbon fractions is well worked out (Section 6.2). Unfortunately the tremendous use of petroleum in the United States has resulted in the consumption of over 50% of our known reserves and, as a consequence, the rate of U.S. crude oil production is decreasing. The country has imported over 50% of its crude oil since 1997 to supplement the diminished domestic supply. 15.3.2.2 Tar Sands and Oil Shales is not competitive with the simple extraction of oil and gas. Oil shales and tar sands may be an important source of petroleum by the middle of the twenty-first century, when the cost of crude oil increases because of its diminishing supply. Tar sands are a mixture of approximately 85% sand and 15% hydrocarbons, chiefly the heavier fractions of crude oil. The hydrocarbons have the consistency of paving asphalt. There are large deposits of this black sand in Alberta, Canada, and in Venezuela, and smaller ones in the western United States. Some of the tar sands can be obtained using open-pit mining techniques. The hydrocarbon-tar mixture is then stirred with NaOH and surfactant to give a frothy foam that contains the hydrocarbons. This foam scraped off the top and the sand are sent to settling ponds. The tar is then cracked and refined to give oil (Section 6.2). Suncor Energy of Fort McMurray, Alberta, Canada, produces and profitably sells 28 million barrels of oil annually using this procedure.6 However, most of the tar sands deposits are so deep that other methods must be used to extract them. The approach looked on with favor at the present time is to warm the tar by injecting steam into the bed; the hot oil forms pools in the vicinity of the injected steam and can be pumped to the surface and processed like crude oil. 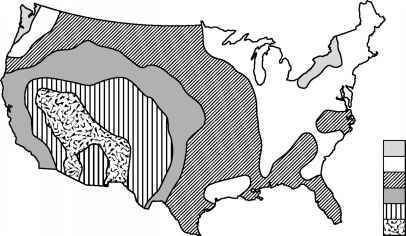 The largest oil shale deposits (sedimentary rock containing hydrocarbon material) in the world are located in Utah, Colorado, and Wyoming. The organic portion of shale oil is a highly cross-linked material called kerogen. Consequently, the shale must be heated to crack this hydrocarbon so that the organic products may be removed from the shale. When shale is heated, gaseous hydrocarbons, an oil, and a cokelike residue are obtained. The oil can be processed in the same fashion as natural petroleum (Section 6.2), while the residual coke is used as an energy source to thermally crack the kerogen in more shale rock. The conversion of coal to petroleum has been investigated sporadically for over 60 years. Germany obtained some of its petroleum by this means during World War II. South Africa has been preparing petroleum this way since the mid-twentieth century. At present the United States is only testing potential coal liquefaction techniques at the pilot-plant level. This process is discussed in more detail in Section 6.9.3. 6R. L. George, Mining for oil, Sci. Am. pp. 84-85, March 1998.
may result from using greater amounts of coal in energy production. One major problem is the release of oxides of sulfur when coal is burned. Bituminous coal from the eastern and midcontinent United States usually has a high sulfur content (3-6%). About half the sulfur in coal is in the form of pyrite (FeS2), of which about 90% can be removed by mechanical cleaning; but the remainder of the sulfur is covalently bound to the carbon and can be removed only by chemical reaction. If this high-sulfur coal is used, then the sulfur oxides (mainly SO2) must be removed from the stack gases after the coal is burned, or the coal must be chemically changed (e.g., coal gasification or liquefaction) in such a way that the covalently bound sulfur can be removed. The removal of SO2 from stack gases has been studied for many years, but the technology that has been developed is still controversial (Section 10.4). The method that is generally considered to be the most efficient is the use of limestone to absorb the SO2. The main drawback is that up to 350 lb (159 kg) of limestone is required to absorb the SO2 emissions from a ton of high-sulfur bituminous coal. As a consequence, 8—9 ft3 (0.2—0.3 m3) of sludge, which must be disposed of, is produced per ton of coal processed. A second problem associated with coal combustion is the formation of nitrogen oxides. This formation is enhanced by the need to carry out the combustion at near 1500°C to get high thermal efficiency. A third problem is the release of toxic heavy metals, e.g., Hg, Pb, and Cd present at low levels in coal. There are calls for restrictions on Hg emissions from coal burning plants (Section 10.6.6). Natural gas is a nearly ideal fuel (Table 15-1). Gas is virtually pollution free; it is easy to transport by pipeline, and it requires little or no processing after it comes from the gas well (although some sources contain H2S that must be removed). Natural gas consists mainly of methane together with some other low molecular weight hydrocarbons. In 1997 it supplied about 23% of the energy requirements of the United States. In 2000 the worldwide reserves of natural gas were estimated by the U.S. Geological Survey to be about 85% of those of petroleum in energy content, and the United States had about 8% of this total amount. These reserves are postulated to last longer because the rate of their consumption is slower than that of oil. The use of natural gas in place of coal or oil has many environmental benefits. It usually contains virtually no sulfur or sulfur compounds, so its combustion does not contribute to the emissions of SO2 and its use contributes only 13% of the U.S. NOx emissions, while coal and oil contribute 84%. Being the least carbon intensive of the fossil fuels, upon combustion it contributes the least amount of carbon dioxide per unit of energy. A commercial-sized plant for the conversion of coal to methane, the Great Plains Gasification Facility in Beulah, North Dakota (Figure 15-4), has been in operation successfully since 1984. It is the outcome of five U.S. pipeline companies' desire to have an alternative supply of methane gas and the U.S. Department of Energy's interest in having a domestic synthetic fuels demonstration facility built. After default on the loan by the original owners, the project reverted to the Department of Energy for three years. It was purchased by the Basin Electric Cooperative in 1988 and is run as both a commercial source of SNG (substitute natural gas, or methane) and as a demonstration facility to investigate the development of various by-products. FIGURE 15-4 The Great Plains Gasification Facility in Beulah, North Dakota, for the generation of methane from coal. The gasification facility is in the foreground. Electricity is generated from the coal fines, which are not suitable for methane synthesis, in the power plant shown in the background next to the large smokestack. Photograph provided by Fred Stern at GPGF. gases, H2S, NH3, and ash are formed. The heat from this process volatilizes phenols, tars, and oil from the coal, which are collected as separate fractions. A portion of the carbon monoxide is further reacted with water to produce additional hydrogen [ ("shift reaction'': equation (6-10) ] so that there is sufficient hydrogen to convert the remaining carbon monoxide to methane in the final synthesis reaction [equation (6-12) ]. After cleanup of this raw gas to remove carbon dioxide, sulfur compounds, and light hydrocarbons, the final synthesis of methane is carried out. Finally, water is removed from the gas to yield methane suitable for pipeline transportation and use as an energy source. The methane from this facility, 160 million cubic feet a day, is shipped by pipeline to the Midwest. The cost of producing methane in this facility is significantly higher than the cost of obtaining methane from gas wells. Therefore the current focus is on the sale of the by-products to ensure that the overall process remains economically viable. Originally about 10% of the income for the facility came from the sale of these by-products, and the goal is to eventually have these compounds provide more income than the sale of methane. The hydrogen sulfide together with the waste light hydrocarbons is burned in the boilers and combined with the ammonia in a flue gas desulfurization unit to produce ammonium sulfate, which is sold as DakSul 45 fertilizer. The remainder of the ammonia is stored in liquefied form and sold. Some of the hydrocarbons and oils formed are used as an energy source at the facility, while the carbon dioxide is used for the enhanced recovery of oil from oil wells. Liquid carbon dioxide dissolves in some petroleum, thus increasing its volume and reducing its viscosity so that it flows more readily. Carbon dioxide is not soluble in heavy oil so its main function is to displace the heavy oil to a location near the pipe used to remove the oil from the ground. Analysis of the phenolic fraction distilled from the lignite during gasification revealed the presence of phenol and alkylated phenols. Currently the gasification facility in Beulah is exploring methods for the separation of these compounds from tars to obtain catechols, which can be sold as starting materials for the synthesis of pesticides, dyes, and pharmaceuticals. In addition, the by-products from the cryogenic separation of oxygen have been found to have commercial value. These include nitrogen, argon, krypton, and xenon. Some of the liquid nitrogen is now being sold and some is used at the site. Krypton and xenon are now being sold while the economics for other gases, such as argon, is being explored. Great Plains facility tried to adopt from the SASOL process of South Africa did not work as anticipated, presumably because of the different grade of coal used. The discussion of nuclear energy in this chapter is limited to the established use of nuclear fission to generate electricity in central station power plants. Weapons-related use is summarized in Chapter 14. Although nuclear power plants (NPPs) do not release the atmospheric pollutants that are emitted by fossil fuel power plants and are associated with the "greenhouse effect" and acid rain, some of their effluents contain radionuclides and are, therefore, of environmental concern. Nuclear power plants are designed to be very nearly closed systems with respect to release of radioactivity into the environment during normal operation. They may release small amounts of fission products and neutron-activated radionuclides. In the United States, the quantities released into the environment are legally limited by the regulations of the Nuclear Regulatory Commission (NRC), which licenses NPPs. To prevent release of radionuclides into the environment if there is an accidental loss of coolant (e.g., pump failure or break in the piping) in an NPP with an LWR7 steam generator, there is an emergency cooling system designed to prevent melting of the fuel rods and release of fission products, uranium and plutonium. If the emergency system fails, escape of radionuclides is prevented by a physical barrier. The reactor and plant components that could contain radioactivity originating in the core of the reactor plant are enclosed in a steel-lined, reinforced concrete, single or double containment vessel (or structure or enclosure or building). The special enclosure also protects the reactor from damage from external forces. Both nuclear and fossil fuel power plants cause thermal pollution by transferring unused heat into the environment. Nuclear plants reject about 66% of the available heat; fossil fuel plants using steam turbines, about 60%. 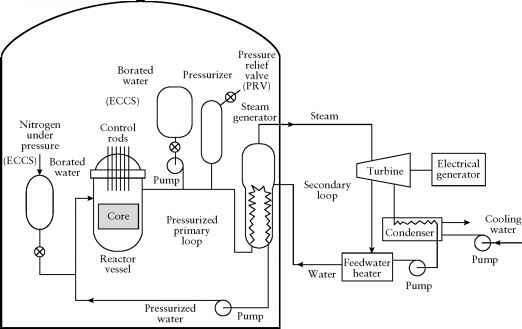 7A light water reactor (LWR) is one that is moderated and cooled by H2O. Year aEastern Europe and the former USSR are included beginning in 1992. 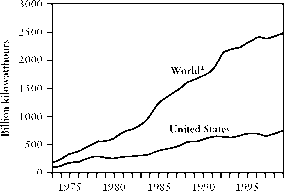 FIGURE 15-5 World and U.S. nuclear electricity gross generation, 1973-1999. Adapted from Monthly Energy Review, Section 10, January 2001. Energy Information Administration, U. S. Department of Energy, Washington, DC. http://www.eia.doe.gov/mer. Prediction of the worldwide nuclear generation of electricity in, say, 20 years cannot be made simply by predicting the demand for electricity in each country, because nuclear power has become a politically divisive issue in many countries, including the United States. For example, Italy has phased out nuclear power, and Belgium, Germany, the Netherlands, and Sweden have made political decisions to phase out nuclear power. When this decision was made in Germany in June 2001, it was assumed that energy conservation, renewable energy sources, and importation of electrical energy from other countries would replace nuclear energy by the time all nuclear power plants are phased out—about 2021. 8Net generation is the electricity available for distribution (i.e., gross minus that needed to operate the plant). and Japan may approximately balance the number to be phased out worldwide. In countries where the nuclear power industry is growing, there is an increasing interest in small (< 300 MWe) and medium-sized (300-700 MWe) plants. There is also an interest in using small nuclear plants to eventually replace gas turbines in cogeneration plants and diesel engines on ships. Source: Nuclear Energy Data 2000, Nuclear Energy Agency, Organization for Economic Co-operation and Development, OECD Publications, 2 rue AndrePascal, 75775 Paris Cedex 16, France (OECD Washington Center, 2001 L Street N W., Suite 650, Washington, DC 20036-4922). In the 1950s and 1960s, nuclear power was seen as the least expensive, most reliable way for the country's electric utilities to meet the projected annual increase in demand for electricity of about 7.5% in the 1970s, 1980s, and beyond. However, an abrupt change in projected demand for electricity in the United States followed the oil crises in 1973 and 1978. Energy utilization not only of oil but also of all energy sources was lowered significantly by conservation and by improved efficiency of automobiles, appliances, and so on. As a result, the annual rate of increase in demand for electricity in the subsequent years dropped to less than 3.0%. It is expected that the annual increase in demand and replacement of aging central station power plants in the future will be met by gas-turbine plants fueled with natural gas. FIGURE 15-6 Number of operating nuclear power plants in the United States 1973-1999. From Monthly Energy Review, Section 8, January 2001. Energy Information Administration, U. S. Department of Energy, Washington, DC. http://www.eia.doe.gov/mer. supplier of electric power will be willing to order a new nuclear power plant, the third of these factors must be favorable relative to that for new fossil-fueled plants that are being built and are scheduled to be built. The majority of these are relatively efficient plants that burn natural gas. Even if generating costs are favorable, a proposed NPP might never be built because of public opposition based on the first two factors. In discussions of new NPPs in the United States it is usually assumed that such plants would be advanced BWRs or PWRs. However, a very different type of nuclear power plant that uses a gas-cooled, pebble bed modular reactor (PBMR) (see Section 14.7.4.4) has been receiving publicity as an alternative. If a proposed prototype (demonstration) plant is built (in South Africa) and is operated successfully, the safety characteristics of such a plant can be tested and the cost of generating electricity can then be estimated. Growth and decline of the number of NPP units operating in the United States from 1973 through 1999 are represented in Figure 15-6. Figure 15-7 illustrates the relative contribution of nuclear power to the total for the same period of time. A comparison of energy production from various sources is presented later (Figure 15-18). FIGURE 15-7 Total and nuclear net electricity generation in the United States, 1973-1999. Adapted from Monthly Energy Review, Section 8, January 2001. Energy Information Administration, U. S. Department of Energy, Washington, DC. http://www.eia.doe.gov/mer. nuclear energy to meet their present energy needs. They have, in fact, supported the development of fast breeder reactors, because such reactors convert the relatively abundant, nonfissile 238U into fissile 239 Pu and have the potential of providing long-term energy independence. However, the availability of 235U (after dilution with 238U) and 239Pu (after dilution with 238U to form MOX (see Section 14.7.2) contained in the post-Cold War nuclear weapons stockpiles as fuel for NPPs has reduced somewhat the urgency for developing fast, liquid-metal-cooled breeder reactors. On the other hand, India, which has an abundant supply of monazite sand containing thorium but little uranium, is developing power reactors, including fast breeder reactors, which use the thorium fuel cycle (Sections 13.6.3 and 14.7.2) with 233U as the fuel. 15.4.3.2 Safety made in the United States by the nuclear power industry, the Nuclear Regulatory Commission through its regulations and inspections, and other safety organizations providing education and training to improve the safety record of nuclear power plants. In general, the effort has been successful and is perceived to have made nuclear power somewhat more acceptable to the public. Table 15-4 shows the unit energy content of coal, natural gas, oil, and uran-ium-235, as well as the quantities of fossil fuels that are equivalent in thermal energy content to one kilogram of uranium-235. Nonnuclear power plants that burn oil or natural gas have no spent fuel disposal problem. Spent fuel from a NPP is highly radioactive and requires safe storage at the plant site or at a temporary storage site until it can be taken to a geological repository for disposal as high-level radioactive waste. Although ash from a coal-fired plant contains chemical components of environmental concern (Section 6.9.1), its disposal is less challenging than that of nuclear fuel. However, spent nuclear fuel is discharged from the reactor less frequently (e.g., once in 12 months to once in 24 months). a1 Btu = IBritish thermal unit = 1.054kj; 1 bbl = 1 barrel = 42 gal(U.S.) = 0.159m3. Values for 239Pu and 233U are essentially the same as that for 235U. cUnit energy varies from 14Mj/kg for lignite to 35 Mj/kg for bituminous coal. by any type of central station power plant involves many costs in addition to that for fuel. Nuclear power plants are more complex and, therefore, take longer and are more expensive to build than other plants having the same generating capacity. In addition to the reactor, safety-related construction costs such as those for the reactor vessel, the containment structure, the emergency cooling system, and temporary storage facilities for spent fuel are among the many costs that are unique for NPPs. Capital carrying charges for construction of a plant increase as the construction time increases. Construction time for nuclear power plants in the United States increased from an average of about 6 years prior to 1979 to an average of 11 years (with an upper value of 19 years) by 1989. By contrast, construction times have been about 6 years in France and South Korea and as low as about 4 years in Japan. One reason for increased construction time in the United States was delay caused by litigation9 brought by antinuclear groups and by others with the NIMBY (not in my backyard) philosophy. A second reason was delay resulting from design changes that were made during construction to ensure that the plant would meet new licensing criteria that reflected new safety features required by the NRC. Similarly, retrofitting new safety features into existing plants raised capital costs. Construction costs (adjusted for inflation) for a NPP in the United States increased from an average of about $800/kWe of generating capacity in the early 1970s to as high as about $3000/kWe for a plant at the end of the growth period 20 years later. It is expected that the new modular LWR plants that are precertified by the NRC will take 5 or 6 years to build and will have construction costs estimated to be between $1000/kWe and $1700/kWe. It is very likely that if modular reactors are built, they would be placed on the sites of existing NPPs. Capital charges are estimated to be about 81% of the total cost for generating electricity for a new NPP, about 73% for a coal-fired plant, and about 28% for gas turbine plants. The contribution of fuel to the total cost is about 8% for NPPs, about 18% for plants burning coal, and about 67% for gas turbine plants. 9The cost of the litigation itself adds to the total cost. shutdown makes operation of a power reactor uniquely different from any other steam supply. The percentage of total generating cost stemming from O & M is about 11% for NPPs, about 10% for coal-burning plants, and about 5% for gas turbine plants. When an LWR power plant requires refueling, it must be shut down. During the scheduled shutdown (outage), maintenance work is performed. By 1999 the outages for some plants had been reduced from about 120 days to less than 20 days. In addition, the frequency of unplanned shutdowns has been reduced so that most plants are operating above 88% of annual capacity and some are at 100%. As a means of improving operation and lowering operating and maintenance costs for existing plants, a number of utilities have arranged to have their nuclear power plants either operated by or purchased by companies that specialize in the management and operation of nuclear power plants. Some utilities have merged and others have combined to form joint operating companies for their nuclear power plants in order to make them more competitive. These efforts to reduce O & M costs for well-operated NPPs in the United States have succeeded in bringing the average cost of electricity down sufficiently to be competitive with plants fueled with coal. The presence of ionizing radiation makes maintenance of certain regions of a nuclear power plant difficult and expensive. The requisite radiation safety program for monitoring plant workers adds to the operating cost of a nuclear power plant. A number of utilities have been fined heavily by the NRC because of operational safety problems. In general, safety of operation has greatly improved over the years. For example, the collective exposure to ionizing radiation of plant workers is about 80% lower than it was two decades ago. When an NPP ceases to operate and is decommissioned, it can be mothballed temporarily or it can be dismantled immediately, decontaminated, and the buildings put to other use or demolished to provide a "green field" site. Whenever an NPP is dismantled, a large volume of radioactively contaminated structural material and equipment is generated. The rate that the owner of an NPP charges its customers for electricity includes an amount that is accumulated in a decommissioning fund during the lifetime of each of its nuclear power plants. Also included in the cost of operation of a nuclear power plant are (1) a security program to protect the plant from intruders including terrorists and (2) a safeguard and accountability program to assure that the plutonium produced in the plant is not accessible for use as a weapons material or as a radiotoxic contaminant. There are several important ways that solar energy may be directly utilized, and these are covered in this section. It should also be pointed out that although wind and water are reviewed in a separate section (Section 15.7), the ultimate source of these energies is also of course solar energy. These energy sources are renewable, in contrast to fossil and even nuclear fuel sources. Table 15.5 at the end of Section 15.7.3.3 gives a summary comparison of most of them. 10In 1990 the United States consumed 2.4 x 1013 kWh (82 quads) of energy, which was 24% of the whole world's use of about 1014 kWh that year. By the year 2026 the annual world energy use is predicted to increase by about 50%. FIGURE 15-8 Average annual solar radiation in the United States. From K. Zweibel, "Harnessing Solar Energy," p. 220. Plenum Press, NY, 1990.
as much as 90% of the total solar radiation, whereas on very cloudy days 100% of the available sunlight may be diffuse. Utilization of the two components of sunlight depends on the technique being employed. Diffuse light produces "low-grade'' energy, which can be used, for example, for solar heating. However, production of "high-grade'' energy, such as conversion directly to electrical energy with photovoltaic cells, in general requires direct sunlight. Probably the most effective uses of solar energy will involve simultaneous integration of technologies, such as the hybrid units of photovoltaic and solar thermal energy cells currently being developed. 11Photosynthesis is the process by which green plants, algae, and some bacteria convert light energy to chemical energy to sustain their life. It has existed in its present form for at least 3.5 billion years, and undoubtedly it is the most important photoprocess occurring in nature. Since all the earth's coal and oil deposits come from past photosynthesis, all our food and most of our fuels are products of this process. in which (CH2O)n represents any carbohydrate, including sugars, starches, and lignocellulose. Biomass has been used for many centuries for heating, lighting, and cooking. It is still the primary source of energy for half the world's population and produces 13% of the world's energy, but in the developed industrial countries fossil fuels have been much more widely used for many years.12 The use of biomass for the generation of electric power, which historically has been used primarily by the paper and wood products industries utilizing waste wood fuel, is expected to increase in the United States from approximately 10 GW in 1997 (about 2% of the total U.S. generating capacity) to more than 100 GW by the year 2030. In addition, there are well-established methods for producing liquid (biofuels) and gaseous (biogas) fuels from biomass (Chapter 6). Brazil, for example, has developed an extensive fuel program for production of ethanol from sugarcane: in 1995, 35% of the passenger cars in Brazil were fueled with pure ethanol, the remainder using blended fuels containing 22% ethanol. An 85% ethanol (15% gasoline) fuel is being marketed in the United States for use in automobiles designed to run on it and on 100% gasoline. 12However, in the United States biomass is nevertheless the second largest renewable energy source (after hydroelectric power: see Section 15.7.3.1). will make sense only if there is an overall net positive energy balance,13 and processes such as the production of nitrogen fertilizers are very energy intensive. It is estimated, for example, that the net energy balance for the production of ethanol from wheat, a cultivated crop grown from seed, either is negative or has a low positive energy balance (between 1.0 and 1.2). On the other hand, energy balances for SRC may be positive by at least an order of magnitude. It is also worth noting that biomass is generally lower in sulfur than most coals. This may be an important benefit of biomass in view of recent regulations in some countries reducing SO2 emissions by electric power utilities. There are, however, several serious environmental concerns with use of biomass as a major renewable energy source. Intensive agricultural practices often lead to nitrification of water supplies and pesticide and herbicide residues. Major production of biomass for energy usage will also require large land area commitments. For example, it is estimated by the U.S. Department of Energy that about 100 mi2 (25,000 hectares) of land will be required for an advanced 150-MW biomass power plant, which means that approximately 70,000 mi2 (about 2% of the total land area of the country) will be needed to meet the above estimate of 100 GW of electrical power from biomass by 2030 if there are no major increases in biomass productivity. Some major agricultural areas in developed countries can produce far more food than is needed by their residents, and biomass growth for energy purposes may lead to more effective use of productive but uncultivated land. For some developing countries, however, emphasis on biomass production could lead to intense competition between land and water use for food and for biomass energy production. 13Net energy balance is a measure of the difference between the energy contained in the biomass fuel and the total energy required to grow, harvest, and process the crops used in its production. Often the net energy balance is expressed (as we will do here) as a ratio of these two quantities (i.e., the energy contained in the biomass fuel divided by the total energy used in its production). solar energy. The renewal of an abundance of low-cost oil led to a decrease in this activity by utilities since the early 1980s. Nevertheless, at this time the space heating and cooling of buildings is probably the most developed direct usage of solar energy, although hydroelectric power, which is a form of solar energy utilization (see Section 15.7.3.1), generates much more energy than is converted to thermal energy by solar energy collectors. Since this is low-temperature energy usage, it readily lends itself to utilization of solar energy, and the basic technology is available now. Homes and buildings with roof solar collectors for domestic hot water are now common sights, particularly in regions of high and extensive sunshine such as the southwestern United States. Solar heating and cooling may be divided into two categories: passive and active. Passive systems use only natural conduction, convection, radiation, and evaporation, while active (nonpassive or hybrid) systems employ external energy to run fans, solar circulating pumps, water pumps, and so on. The early active systems were quite complex and unreliable, and the trend in recent years has been toward simplicity in passive and hybrid systems that use minimal nonrenewable energy sources. In most locations the installation and maintenance costs of active systems still substantially exceed the energy cost savings, but passive systems are cost-effective in many areas. A typical procedure is to use a solar collector to absorb the solar energy, converting it to thermal energy, which is transferred by heat pipes or pumped fluids directly for low-temperature (< 100°C) heating or for storage. The collector should therefore have high thermal conductivity and low thermal capacity, such as metals (copper, steel, and aluminum) and some thermal-conducting plastics. The most common collectors are flat blackened plates, since they convert both direct and diffuse (cloudy) solar radiation into heat. Heat losses from collectors result mainly from reflection, thermal (blackbody) emission (Section 3.1.1), and convection. Reflection and thermal emission losses can be reduced by selective surface coatings, and convection losses are reduced by covering, or glazing, the front of the collector with a glass that transmits most of the radiation but traps the convection heat between the absorber and the glazing, and by insulating the back side of the collector. (Further reduction in convection loss—almost to zero—is attainable by evacuating the space between the collector and the glazing, but such collectors can be very expensive to manufacture and maintain.) In many cases (up to 100°C), water is the heat transfer fluid. Liquids with high specific heats (such as mineral oils and glycols) are employed at higher temperatures, however, and at very high temperatures molten salts or liquid sodium are used. Although it is best to use the converted solar energy directly, sunlight is intermittent. Thus storage of the converted thermal energy is a very important factor in its efficient and economical utilization. Several large-scale energy storage techniques are covered in Section 15.8. However, heat can be stored for several days by sensible (specific) heat storage using water or other fluids in insulated tanks or rocks (pebble bed) for gas, and by latent heat storage with phase-change materials.14 Materials used for latent heat storage are generally more expensive than those used for sensible heat storage but have a much higher density for energy storage. For example, calcium chloride hexahydrate (CaCl2 • 6H2O) is extensively used as a phase-change material involving its latent heat of fusion (melting); it melts at about 27°C, has high thermal stability, and can store 2.8 x 105kJ/m3. By comparison, water would have to be heated about 67°C to store as sensible heat an equivalent amount of thermal energy stored as latent heat by CaCl2 • 6H2O for the same volume. Direct (but only a small fraction of diffuse) solar radiation can be concentrated by reflecting light with an array of mirrors (a heliostat) onto a common collector. Heat losses are minimized because the surface area of the absorber can be relatively small, and very high temperatures are possible. An extreme example is the experimental High Flux Solar Furnace built in 1989 at the National Renewable Energy Laboratory (NREL) in Colorado, in which the intensity absorbed by the collector furnace, using a series of focused heliostats, is equivalent to 50,000 times the intensity of direct (unfocused) sunlight, generating temperatures up to 3000°C. We will see in Section 15.5.3.2 that this technique is extensively used in solar thermal electric power systems.